As mentioned in the foreword to this section, the Public Works Agency (PWA) operates and maintains five active County Service Areas (CSA) which provide water and wastewater service to several areas in the County. Each CSA is separately financed by revenue from its customers. Although the systems are owned and operated by Amador County, each CSA has an appointed advisory committee, composed of system users, whose function it is to communicate with PWA on matters that concern the system residents. Deficiencies in the water and wastewater systems. Because many of the Grand Jury's recommendations are derived from one or more of the topics listed above, all recommendations for improvement of the CSAs are included as a final part of the CSA report. Amador Regional Sanitation Authority (ARSA) wastewater transport system. Amador County PWA, "Amador County Service Area #3 - Water System Improvements, Summary Report, July 1995"
SPH Associates, "Surface Water Feasibility Study - CSA #3, December 1994"
Black and Veatch Corporation, "California Water Charge Survey, 1999"
The Chlorine Institute, Inc., "Water and Wastewater Operators Chlorine Handbook, March, 1999"
Numerous letters, consulting engineers reports on water supply, internal reports, personnel records, newspaper articles and other data furnished by several Amador County agencies and departments. The three CSA managers report to the Public Works Maintenance Superintendent. Every work day, the three CSA mangers meet with the Public Works Maintenance Superintendent at 7 am to discuss the day's work. The meetings are held at the County corporation yard in Martell. Most Monday mornings, a safety meeting is conducted by the Public Works Maintenance Superintendent for the CSA managers. The Public Works Maintenance Superintendent has little experience or training in water or wastewater operations and maintenance. A computer-based supervisory control and data acquisition (SCADA) system was installed in 1995 on the CSA #3 water system. The SCADA system transmits operating data to a central station to enable operating decisions to be made more efficiently. The PWA management staff reportedly access the SCADA system from remote locations without coordinating with the CSA #3 manager. The CSA #3 manager has received no formal training in the proper use of the SCADA system and the operating manuals are reportedly kept at the PWA's main office in Jackson. There do not appear to be any operating and/or maintenance manuals for the CSAs, nor does there appear to be a preventive maintenance program in place. Relationships between the PWA Director and CSA #1 and #2 Advisory Committees are generally satisfactory. However, the relationship between the PWA Director and the CSA #3 committee is acknowledged to be strained by both parties. The CSA #3 office facilities are satisfactory. However, the CSA #1 & 2 office is inadequate and there is no shop area provided. The CSA #4 & 8 situation is even worse; there are no office or shop facilities whatsoever, forcing the manager to conduct all his business from the cab of his truck. The "California Waterworks Standards" (Title 22, Division 4, Chapter 16 of the California Code of Regulations) specifies minimum acceptable standards for water systems. Standards include: requirements for storage; minimum service pressure [20 pounds per square inch gage (psig)]; avoidance of dead end water mains; valve and hydrant spacing and minimum size for water mains (4-inch diameter). The California Public Utility Commission (PUC) regulates investor owned utilities in California. Although the County water systems do not fall under PUC jurisdiction, the PUC standards are deemed applicable. They include such things as: normal operating pressures (40 to 125 psig); minimum size for water mains ( 6-inch diameter); and fire flow requirements ( 500 to 1000 gallons per minute ). The National Board of Fire Underwriters (NBFU) publishes standards for fire flow requirements. Using the formula developed by NBFU, a community with a population of 1,000 would require a fire flow of 1,000 gpm for four hours. The transportation of chlorine is regulated by the United States Department of Transportation (DOT). Applicable DOT regulations appear in Title 49 of the Code of Federal Regulations (49CFR). Requirements for safe handling of chlorine in water and wastewater facilities are described in the Chlorine Institute's "Water and Wastewater Operators Chlorine Handbook". There are no overall as-built maps of the water and wastewater systems. The maps given to the Grand Jury for study included construction drawings and small scale drawings marked up by the CSA managers. Therefore, information derived from the maps for this report can be considered approximate only. Forty percent of the water mains in CSA #1 are 3-inch diameter or smaller. In Sierra Highlands Units 1, 2, and 3, only 13 percent of the mains are 4-inch diameter or greater. In pressure zone #8, 87 percent of the water mains are 2-1/2-inch diameter or less. Two pressure zones contain no storage and three of the zones had inadequate valving. Five zones contain excessively long, undersized dead-end mains. Fire hydrant spacing is generally inadequate. There are many 2-1/2- inch diameter "wharf" hydrants and 1-1/2- inch diameter standpipes, both of which are considered inadequate for fire suppression. There are no security fences at the McKenzie Tank or the Madrone Tank. The McKenzie Tank has no access ladders, either inside or outside. In addition, the tank is in need of major repairs and corrosion protection. Seventy four percent of the water mains are 3-inch diameter or less. Sixty five percent of the water mains are 2-inch diameter or less. Forty five percent of the water mains are 1-1/2-inch diameter. Valving and hydrants do not meet acceptable standards. The system contains excessively long, undersized dead-end mains. There are two storage tanks in the CSA #2 system. Neither of them is fenced. The Mace Tank is an old 40,000 gallon redwood tank subject to leakage. It has no ladders and the roof reportedly is in need of repair or replacement. There is a high percentage of unaccounted for water. This is confirmed in a report by the PWA, dated July 18, 1995, which states: "Various estimates for water loss in the system by Amador County Public Works Agency/CSA #3 engineering staff have exceeded 30%." With the exception of Pumping Station #12, and Pumping Station #9, well sites, pumping stations and storage sites are either not fenced or inadequately fenced. With the exception of Pumping Station #12, storage tanks are equipped with unsafe ladders, both outside and inside the tanks. It is noted that the 1998-99 Grand Jury Final Report recommended the replacement of these ladders and the PWA response indicated that replacement was "a priority". Chlorine cylinders are transported from the point of delivery at the wastewater treatment plant to Pumping Stations #6, #9 and #12 in a County pickup truck. Approved breathing apparatus are not provided at any of the three buildings which house chlorinators. Leaks were noted in some of the redwood storage tanks. At Pumping Station #10 a diesel storage tank, for the emergency generator, is mounted on a fragile wooden structure and there is no provision for capturing spillage of diesel fuel. At Pumping Station #9, the chlorine room exhaust fan is located near the ceiling rather than at the floor level. At Pumping Station #12 there is no exhaust fan in the chlorine room. None of the four sewage lift stations has security fencing. The sewage lift stations are all located in close proximity to residences, and all are unsightly. Lift Station C is located adjacent to a creek which flows directly to Lake Camanche. Power failures have resulted in overflows in the past. A review of sewage flow charts at the wastewater treatment plant indicates the probability of high rates of infiltration and inflow. Unconfirmed reports indicate an average dry weather flow of 20 to 30 gallons per minute (gpm). Average wet weather flows approximate 50 gpm, indicating an infiltration problem. Peak instantaneous winter flows can be as high as 400 gpm which is indicative of major sources of direct inflow. In April, 1999, a survey was made by the California Rural Water Association of the extent of sludge deposits in the aerated lagoon at the wastewater treatment plant. Their report indicated a significant build up of sludge with an accompanying reduction in the capacity of the pond. They also noted symptoms of anaerobic conditions developing in the pond. The effluent pond reportedly overflowed in 1997 and 1998. In winter, the ground is saturated, flows to the pond are high and cloud cover reduces evaporation; all factors which lead to the possibility of future overflows. None of the sewage lift stations is adequately fenced. The lining of the wastewater equalization basin, which is currently out of service, has deteriorated. The cost of putting the basin back into service will be significant. Water from the well reportedly has a high pH and cannot be used as potable water. Potable water must be trucked in. The access road to the well site is impassable in the winter. A "stock watering trough", located near the well, poses a threat of contamination. The well discharge line is located underground near the tile plant's gray water system, raising the possibility of an undetected cross connection occurring. One employee is assigned to operate both CSA #1 and #2. One employee is assigned to CSA #3 and one employee is assigned to operate CSA #4, CSA #8 and ARSA. The three employees help each other when a job requires more than one person. The CSA managers have insufficient time to accomplish needed tasks. This fact is confirmed by the PWA Director's response to a 1998-99 Grand Jury recommendation where he stated, "Annual inspections generate a list of required work and a needs list, or a 'wish list'. The list is to be kept with the maintenance person at all times and to be used as a reference as to priorities. What usually hap pens is, the maintenance person is overloaded with tasks and can only react instead of being pro-active". (emphasis added). Interviews confirm that maintenance is done on a reactive emergency basis rather than being planned in an orderly fashion. The 1998-1999 Grand Jury recommended that additional staff be added to CSA #3. This recommendation was rejected by the PWA Director on the grounds that it would be too costly (see Appendix B). The County contracts for some services. For example, AWA provides meter reading services, and mechanical help is obtained through a blanket contract with a local mechanical contractor. The cost to the County of using AWA for meter reading is about $7,000 to $8,000 per year. Each CSA is financially self-supporting. Costs of operation and maintenance are recovered through rates charged for water and wastewater services. A 1999 report prepared by Black and Veatch Corporation, surveyed 436 California water service areas for water rates. Based on a usage of 1,500 cubic feet per month, monthly costs for residential use for water systems in California ranged from a high of $91.24 to a low of $5.97. The average rate was $27.04. For cities under 2000 population, the range was $80.35 to $10.50, with an average of $31.21 per month. For each CSA, the Amador County budget shows a line-item entitled "provision for reserves". The amount shown for that item, however, includes several categories of reserves, only one of which is available for replacement of plant and equipment. That category is designated as the "facility replacement reserve". Interviews provide evidence of serious management problems with respect to the CSAs. These include low morale, poor communications and a lack of management attention and direction. The amount of supervision given to the CSA managers is inadequate, due principally to their direct supervisor's lack of knowledge and experience in water and wastewater operations. In addition, there is a low level of management attention from the PWA Director and his staff. Based upon the poor condition of many of the CSA facilities, coupled with the inability of the CSA managers to keep up with their duties, it is evident that little or no routine, or preventive, maintenance is performed. This conclusion is reinforced by the lack of a written preventive maintenance plan. Because the CSA #3 manager has not been trained in the use of the SCADA system, the operational advantages of that system are diminished. Water and wastewater systems are often not operated in the most efficient manner because the CSA managers are not entrusted to make critical operating decisions. The practice of requiring the three CSA managers to attend daily briefing sessions at the PWA Corporation Yard is wasteful of resources. Water and wastewater safety training sessions conducted by a person who, by his own admission "doesn't speak the language", is counterproductive. The CSA managers should have adequate office and shop facilities to properly perform their duties. There is an implied obligation on the part of a public utility to provide a high level of service to its customers. That obligation is not being met by Amador County. When the facilities of the CSAs are compared with regulatory requirements, normal indus try standards and good management practices, they fall far short of what the customers should expect. The most serious system deficiency is found in the CSA #1 and CSA #2 water systems. The high percentage of undersized water mains coupled with long runs of small diameter dead end mains and substandard fire hydrants makes it impossible to effectively combat a structure fire. In this heavily wooded area, the inability to produce sufficient fire flow could have catastrophic consequences. The Amador Fire Protection District (AFPD) has stated that they would respond to a fire with a water tanker truck, but the maximum size tanker available is only 3,200 gallons. Considering that the NBFU recommends a fire flow of 1000 gallons per minute for four hours, the volume of water that could be delivered by AFPD from a tanker truck is considered inadequate to combat a major structure fire. The preponderance of small diameter water mains in CSA #1 and CSA #2 results in low system pressure under high demand conditions. 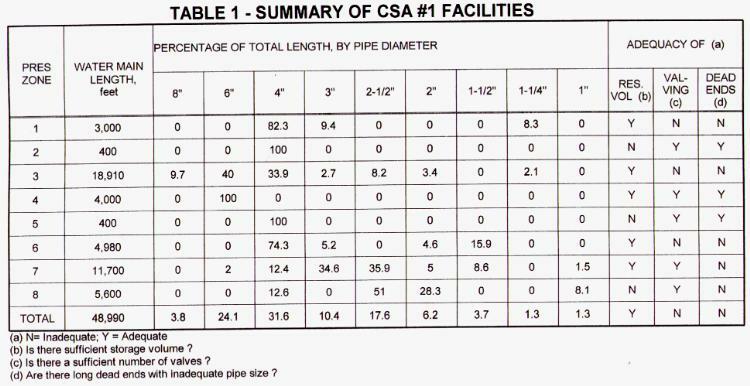 Over 40 percent of the water mains in CSA #1 are smaller than the accepted minimum of 4-inch diameter. The situation in CSA #2 is even more critical with 74 percent of the water mains being of substandard size. Long runs of substandard size dead end water mains not only produce insufficient flow for fire suppression, but they also contribute to water quality problems. The lack of security fencing at storage tanks, pumping stations and other facilities invites vandalism and is a public safety concern. The County would be subject to liability in the event of an injury due to unauthorized entry onto their property. Employee safety is compromised by the lack of ladders on storage tanks, the lack of emergency breathing apparatus at chlorination facilities, and the unsafe transportation of chlorine cylinders. In the CSA #3 water system, there appears to be an unacceptably high rate of unaccounted for water. Some of this can be attributed to leaks in storage tanks and inaccurate metering, but most of the excessive loss is likely the result of pipe leaks. In an area of water shortage, a 30 percent loss should be a major cause for concern. In the CSA #3 wastewater system, liability and public safety concerns arise due to the lack of security fencing at the sewage lift stations. Because the lift stations are in close proximity to homes, concerns are also raised about aesthetics. The same concerns apply to CSA #4, where lift stations are also inadequately protected by security fencing. The wastewater treatment plant in CSA #3 will soon be overtaxed if high rates of infiltration and direct inflow are allowed to continue. Capacity is also diminished by the build up of sludge in the aerated lagoon. There are a number of problems with the water system at CSA #8. The major deficiency is the inability to provide an adequate source of potable water. Without an assured supply of water, the County's goal of encouraging industrial growth in the Carbondale Industrial Park will not be met. The PWA appears to be obligated to provide wastewater services to CSA #8. However, there is inadequate planning as to how this service might be provided for future industrial development. This also may inhibit the County's ability to attract industry. The CSAs are grossly understaffed. The worst example is CSA #3 where a single employee is required to operate and maintain a sewage treatment plant and disposal system, four sewage lift stations, three wells, four water pumping stations, chlorination facilities, a water distribution system and a sewage collection system. Similar inequities exist in the other CSAs. Understaffing results in deferred maintenance and employee dissatisfaction. Employee safety is jeopardized by inadequate staffing. The California Occupational Safety and Health Administration (CalOSHA) requires two employees to perform certain tasks, but with only one operator in each area, expediency sometimes prompts an unsafe approach. The deteriorating condition of many of the CSA facilities is testimony to the effects of a deferred maintenance policy and the lack of a preventive maintenance program. By rejecting the 1998-1999 Grand Jury recommendation for additional staff solely on financial grounds, the PWA Director has shown disregard for employee working conditions, employee safety and the need to provide an acceptable level of service to CSA customers. To provide a proper level of service and a safe working environment for employees, the County will have to commit to a long term program of system upgrading. Rate increases will be required to implement such a plan. A comparison of water rates for the CSAs with rates for other water systems in California indicates that, while on the high side of the averages, the CSA rates are well below the maximums encountered elsewhere. Therefore, although rate increases are politically unpopular, they are not infeasible. The PWA has not accumulated sufficient reserves for replacement to correct the many system deficiencies. In addition, the systems having the greatest needs appear to have the least reserves. Overhead charges to CSAs range from 12.7 to 28.4 % of operating expenses. The reasons for the relatively high percentage of overhead expenses and the wide range are not apparent. The Board of Supervisors should assess the effect of current PWA management practices on the morale and efficiency of the CSA managers and take action to improve communications and supervision. This matter is addressed in more detail in the section of the PWA review entitled, "Agency Organization and Management". Replace substandard water mains so that the minimum size mains are 4-inch diameter. Eliminate long dead end water mains by "looping" the replacement mains. Provide valving to meet the requirements of the California Waterworks Standards. Replace standpipes and wharf hydrants with hydrants meeting NBFU standards. Provide security fencing at all water and wastewater facilities. Replace unsafe ladders on storage tanks. Provide approved emergency breathing apparatus at all chlorination facilities. Conduct a leak detection survey in the CSA #3 water system and make repairs so that unaccounted for water is reduced to about 10 percent. Conduct an infiltration and inflow study of the CSA #3 sewage collection system and take whatever steps are indicated to reduce infiltration and inflow to acceptable levels. Repair leaks in storage tanks and make other repairs as necessary to ensure adequate service. Progressively replace old storage tanks with new ones. Construct a collection basin under the diesel storage tank at Pumping Station #10 in CSA #3, and reinforce the tank supports. Provide adequate ventilation facilities at all chlorine rooms. Provide an emergency generator at sewage lift station C in CSA #3. Remove accumulated sludge from the aerated lagoon at the CSA #3 Wastewater Treatment Plant. Prepare adequate as-built maps of all the water and wastewater systems. The Board of Supervisors should carefully examine the staffing needs of the CSAs and provide an adequate budget to ensure a good working environment, employee safety and proper maintenance of facilities. Add at least one, and preferably two, full-time employees to assist the CSA managers. Eliminate the need to contract with AWA for meter reading by assigning that duty to one of the new employees. Establish a clearly defined decision-making process so that decisions are made at an appropriate management level. The process should include a procedure for communicating and documenting critical decisions. Train the CSA #3 manager in the use of the SCADA system and make that person the system controller with day-to-day responsibility for system operation. Assign one of the CSA managers as safety officer and train that person to conduct meaningful safety training. The safety officer should be responsible for advising the PWA Director on all safety matters. Provide adequate office and shop space for the CSA #1 and #2 manager and the CSA #4 and #8 manager. Review the requirements of 49CFR and revise the method of transporting chlorine cylinders to conform to that code. Develop a comprehensive preventive maintenance program. The plan should describe the required maintenance and frequency for every item of equipment and plant. It should also include a section on monitoring and documentation to ensure the work gets done. The PWA Director should meet with each CSA Advisory Committee and inform them of: (a) the extent of system deficiencies, (b) agency plans for progressive improvements to the systems, (c) the estimated cost of such a plan, and (d) the probable effect on the rates for water and wastewater service. In future years, provide a separate line-item in the County Budget which identifies the "facility replacement" component of reserves. Commission an independent financial and management audit of the CSAs to ensure that such things as overhead and allocations are being properly accounted for, and that the rate structures are fairly applied.